Give yourself a random, fairly complex subtraction problem in your head… say, 430 – 282 = ? Pay attention to how you do it. No cheating, no using scratch paper. You have to do it in your head. Got your answer? OK, read on… we’ll talk about the answer in a minute. This image has been making its rounds on Facebook and the interwebs. It’s reportedly an assignment given to a second or third grader teaching some crazy, newfangled, nonsensical math that is dictated by the Common Core. Isn’t the Common Core horrible? This makes no sense! Not even the kid’s engineer parent can understand it!! Wow, that parent really let the educational system have it! I mean, if he or she can’t understand the way they’re teaching basic math on a grade 2 or 3 level even though s/he’s an engineer and can do differential equations, it must be worthless and just make no sense, right? Why are they screwing up our kids’ brains?! OH THE EVIL COMMON CORE HAS DONE THIS TO US! See, there are very solid educational foundations to the approach pictured. We were never taught this way in school, because our curriculum focused entirely on ‘the way we’ve always done it’ and solely on ‘math we can build on to teach things like differential equations later’. So this is new, and it has a purpose. This fosters the ability to do this sort of math problem in our heads. That’s what us educator types like to call “critical thinking” – it’s teaching a kid to be able to do the math entirely in her head. Isn’t that kind of awesome? That way she doesn’t have to take out a piece of paper and write out the problem as the engineer did in this photo. Some of us have taught that to ourselves on our own, not really realizing that we did it. But often it didn’t click until way later – high school or college, and until then we fumble with those sorts of numbers unless we can write the problem down. Sometimes the skill to compute in our brains doesn’t click at all, and you’ve seen that, any time you confuse a cashier with a weird amount. This sort of math lesson teaches more hands-on and everyday skills. All of this so that hopefully in 10-15 years, when kids exposed to this ‘new math’ are old enough to hold jobs, when you hand a cashier $21.26 to pay a $16.16 total, you don’t get that blank deer in headlights stare. 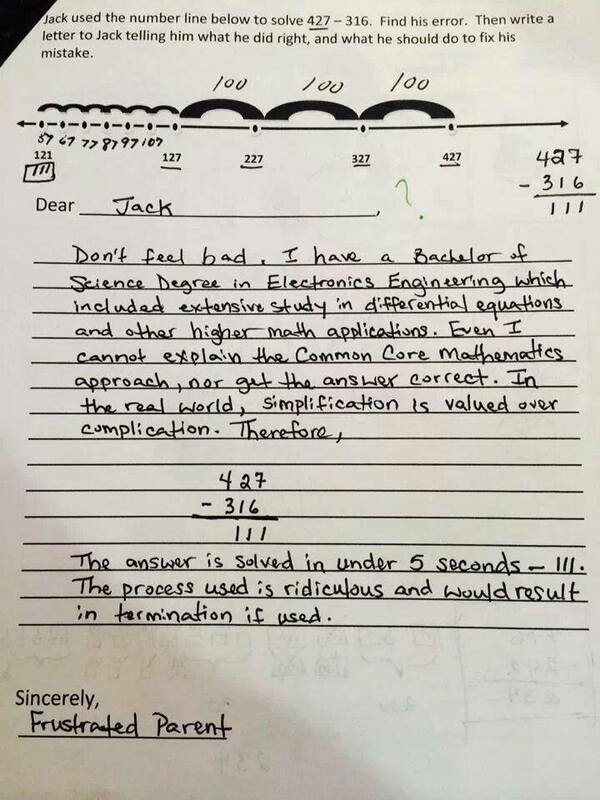 This sort of math, and various other strategies our kids will learn, are much more appropriate than sticking ONLY to the approach we were taught as kids… which is still taught as a foundation. That good-ol’-way of doing it hasn’t been abandoned, for goodness sake. But for a kid who might not go to college, let alone need to do differential equations, this is a much more useful tool to take into the workforce. Common Core does not dictate any specific curriculum or approach. For grade 3, for example, Common Core standards simply say: “Fluently add and subtract within 1000 using strategies and algorithms based on place value, properties of operations, and/or the relationship between addition and subtraction.” This builds on “Add and subtract within 1000, using concrete models or drawings and strategies based on place value, properties of operations, and/or the relationship between addition and subtraction; relate the strategy to a written method. Understand that in adding or subtracting three-digit numbers, one adds or subtracts hundreds and hundreds, tens and tens, ones and ones; and sometimes it is necessary to compose or decompose tens or hundreds.” from the grade 2 learning standards. Common Core, as you may be aware – or maybe not – is ONLY a broad list of learning standards that students are expected to meet by the end of each grade level. It does not dictate curriculum, it does not dictate specific content. It did not make this teacher use this specific worksheet. Too bad this engineer doesn’t have a degree in education or he might appreciate all that.